« Cukes + tomatoes = gazpacho! Gardeners fall in love easily. It is typically a tomato that wins my heart every year. It was the Orange Blossom last year; another year it was the German Johnson. My crush this year is on the Old German. And I’m not talking about CRR (heh, that joke never gets old). The Old German is an heirloom but it’s sturdier than most, perhaps because it has a Mennonite provenance. It harks back to the mid 1800s from the Shenandoah Valley of Virginia. It has not crumpled under the 90+ heat wave that is burning up some of our other tomatoes. 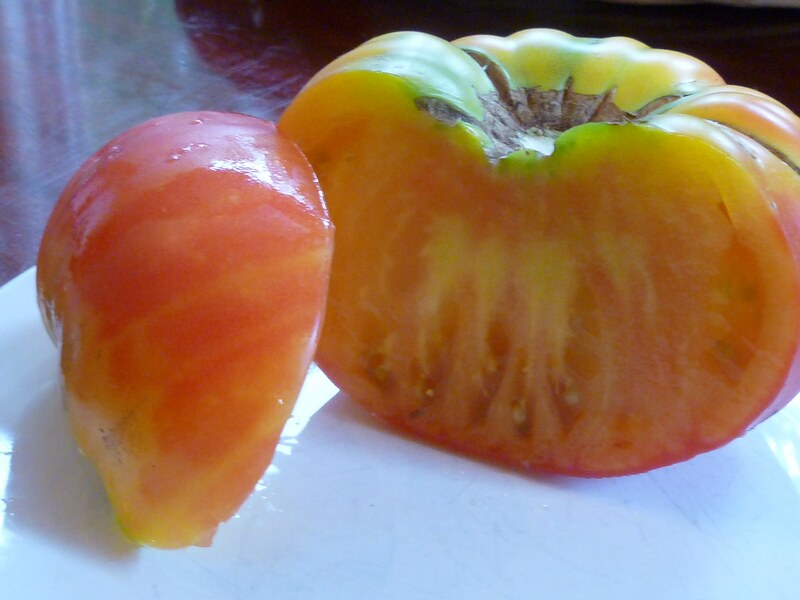 The Old German is huge – the tomato branches bow under the weight. Each fruit does indeed weigh up to two pounds, as advertised. The coloring is amazing. It looks like a sunset: red blushing to orange and yellow, or yellow flushed with reddish streaks, each one is different. The taste? One seed catalog called it “rich and full-bodied,” like a fine wine. I’ll toast to that.